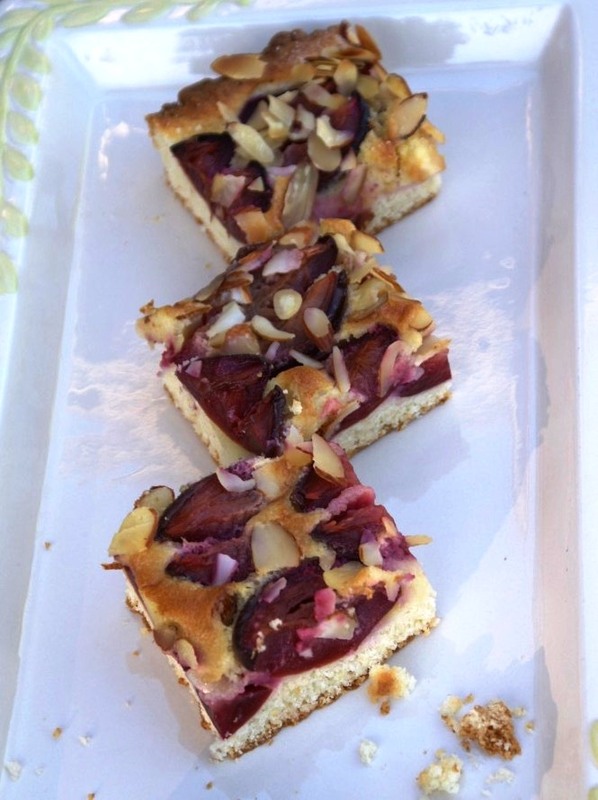 German plum cake is a dear guest at our house at least once a year (while the Stanley plums are in season). The recipe reminds me so of my high school years. I sat in my German class and looked through a German magazine trying to find an article to practice translating. I came across a beautiful photo and recipe of this cake, so I asked my teacher if I could translate the recipe instead of an article. She thought it was a great idea. This recipe has been in my old, yellowed recipe book ever since. The cake is easily made and it’s huge. It can feed a large group of relatives or friends. It’s good warm or cold and it goes so well with a cup or morning coffee or tea. Enjoy my friends! 1 large rectangular baking pan (13 X 18 inches ) 33 X 46 cm. For the dough combine cream cheese, sugar, vanilla in a mixing bowl. Start mixing at a low speed, slowly adding milk and oil. Add juice and lemon zest. Combine flour and baking powder and stir well. Gradually add to the rest and mix until well combined. Wash, dry and pit plums. Half them and make a small cut on each half (as you going to quarter them), but don’t cut all the way through. Dust your working surface with flour. Place the dough on the surface and roll it out into the size of the pan. Line your baking pan with parchment paper and transfer the dough onto the pan. 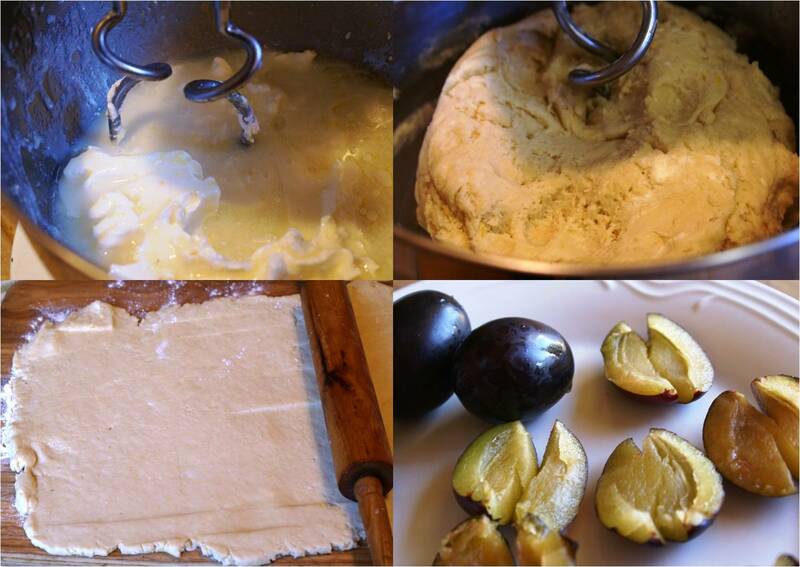 Place the plums in thick rows on the dough. Sprinkle with 3 TBSP of sugar. Beat 2 large eggs with sugar and vanilla until pale yellow, add flour and mix until smooth. Bake at 200 C (400 F) for 30-35 minutes or until lightly brown on the top. Cool slightly and slice into squares. Next > Go out there and find beauty! 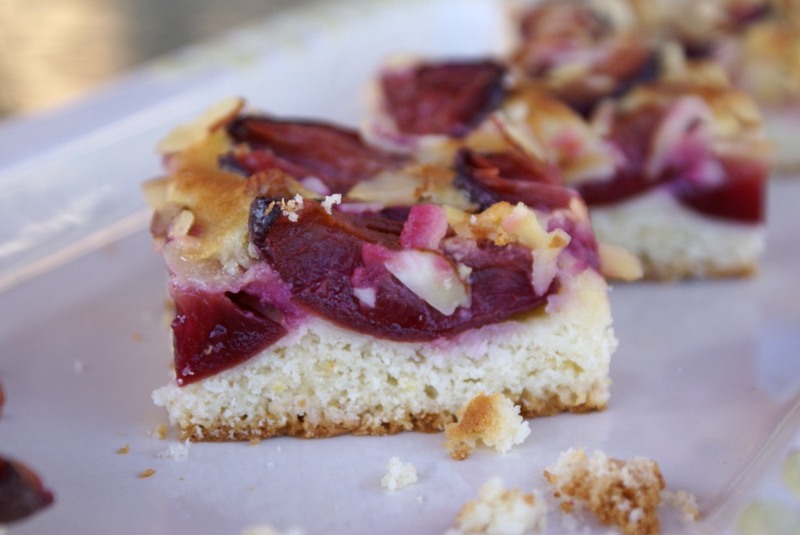 I love plums so I will have to try this one! Looks so good! Just so you know, I have never heard of Stanley plums, but from your description of them and the pictures, they are certainly what we (in NY at least) call Italian plums. My grandmother and sometimes my mother called them prunes, but they were probably just thinking in Italian and translating literally. I’m coming to visit my friend again so I’ll see you on Monday. Glad to hear from you! 🙂 Yes, you’re right these are Italian/prune plums. I also call them Bosnian plums. 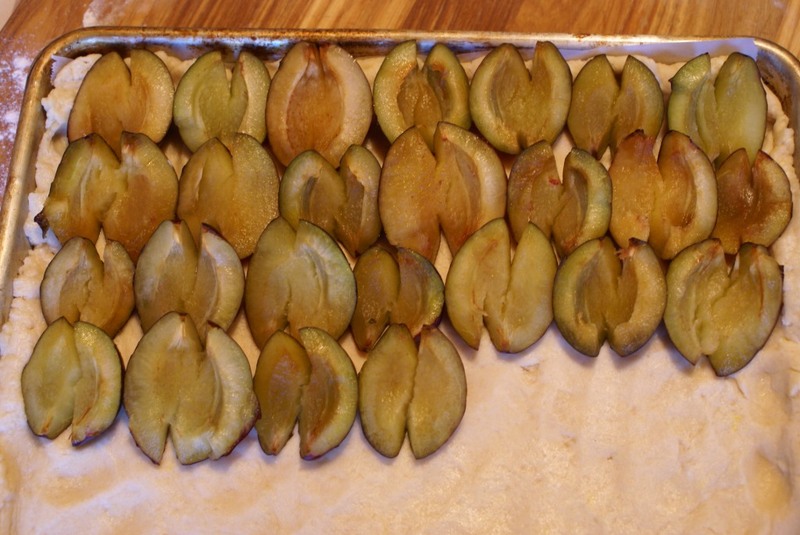 Here they are sold as Stanley plums… Looking forward to seeing you Monday! Looking at those pictures makes me a little teary. 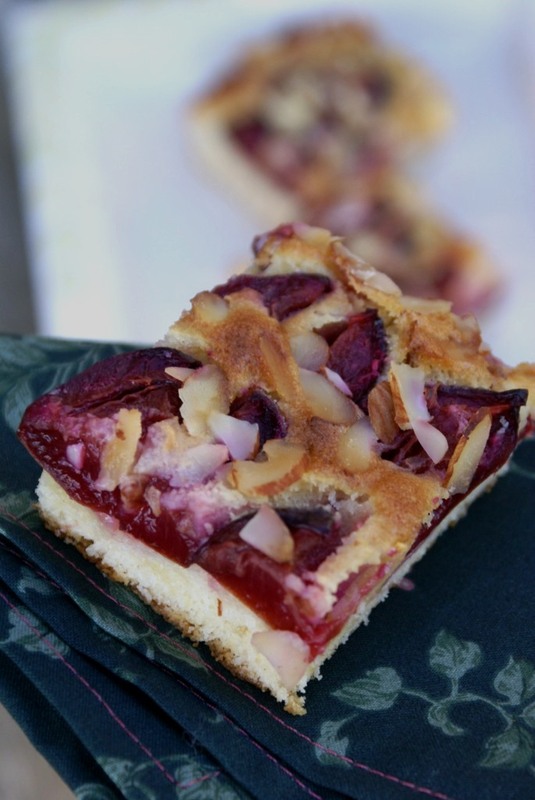 I wish I could have a slice of this gorgeous-looking cake – those plums look amazing! I love reading about the stories behind your recipes too – what a great memory and discovery of this recipe! 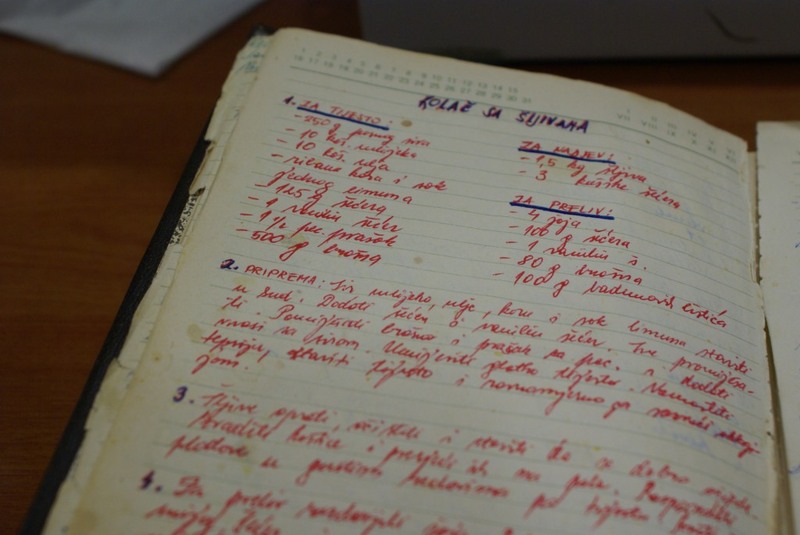 Love the red writing in your recipe book – but I can’t read it. Wonder why? Thanks Angie! 🙂 Would love to know how the gluten free version turns out! aaaaahhh brings back memories, when I was au-pair in Germany they used to make this. I must make it again following your recipe Sibella!! Oh my gosh – this is absolutely gorgeous! Your photographs are wonderful. I cannot wait to give this a try. Thank you! 😀 I hope you do give it a try and let me know how it was! What a beautiful cake, Sibella. Love that it includes cream cheese and lemon juice/zest in the dough. Thank you Kathleen. Cream cheese makes the dough really soft and lemon gives it a very nice flavor. 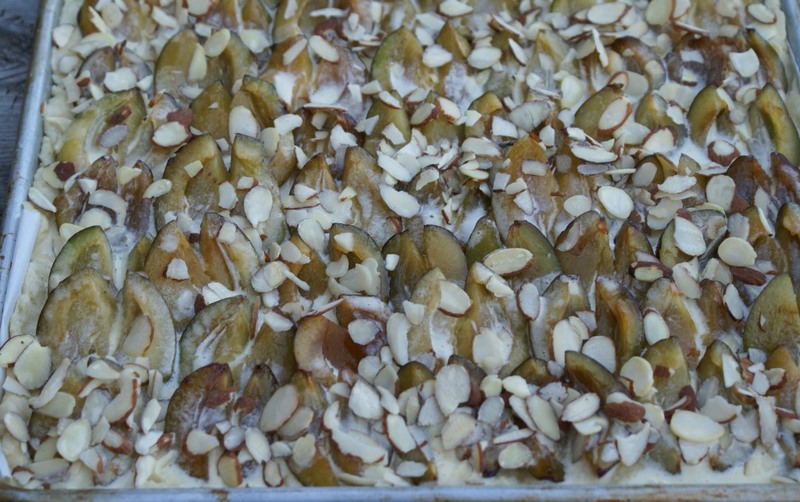 This is definitely my Top Fall Dessert Recipe! 🙂 Have a great Sunday! Mmm, this sounds delicious! I love when you put lemon in the dough, it always gives you that extra touch!